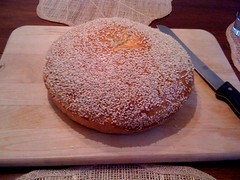 Yesterday I wanted to bake again, but I didn’t feel like making baguettes. 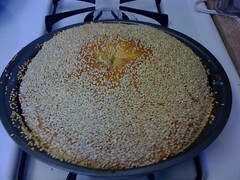 I looked through a few of my cookbooks and found a recipe for a sesame in The Vegitarian Epicure. It turned out to be a pretty simple ad quick bread — about 3 hours from start to finish, which of course involved about 2 hours and 45 minutes of waiting for it to rise and bake. The recipe was simple enough — flour, salt, egg, oil and yeast, and though I had some problems with the food processor (I should have put the water in first, since after I poured it on top it started dripping out the bottom), I cleaned everything up, did a little extra kneading by hand, and added a little more water back in to get back on track. 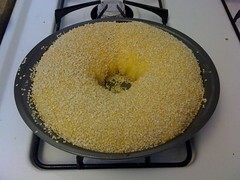 It rose for about an hour before I formed it into a ring in a shallow cake pan, and then another hour later, I brushed the top with an egg yolk and put on the sesame seeds (it basically looked like a giant bagel). That’s when I ran into a little more trouble. I started to preheat the oven, but when I came back to it, it was cold. We’d had a problem with the stove earlier in the week and though the pilot lights for our burners were on, the one for the oven wasn’t relit. And let me tell you, lighting the pilot light on my Maytag oven was not really a one-person job — after many failed attempts, I finally had to lie completely on the floor with my arm entirely in the broiler holding a lit match, and stretching my other arm up to push in the oven temperature knob. I finally got the oven back in working order, but it had already been about 20 minutes since I was supposed to put the ring in the oven, and it seemed to be rising faster and faster. After the ring had been baking for 50 minutes, I opened up the oven to find an enormous loaf of bread that wasn’t much of a ring at all — there was just the slightest remnant of the hole in the center. In any case, the bread tasted very good, and I would definitely try it again, maybe on a cookie sheet this time, too, so I could make it a bit bigger and hopefully preserve the ring shape. While The Vegitarian Epicure said to serve the sesame ring with a greek feast, I decided to head to the other side of the Mediterranean and make a Moroccan-inspired meal. My sister had brought me some spices back from Morocco about a month ago, and I’d been waiting to use them for a tasty meal — so far I’d only used them to season roasted chickpeas. I decided to make a saffron rice pilaf, which I modified slightly from a recipe I found online, and then I improvised a lentil and eggplant curry with moroccan spices, which turned out very tasty — and I’ve posted the recipe below. I also served some hummus with tomatoes, cucumber and lavosh bread. Of course, I didn’t think to take a picture of the meal until we were all served, but it was very tasty. I also took all the photos on my iPhone, so I apologize for the blur and sort of funny colors. My parents and sister joined us for dinner (this was definitely a meal to share), and after we ate everyone tested out their arm strength on Evan’s pull-up bar (I put some photos of the pull-ups on Facebook). I can’t do a pull-up and neither can my sister, but we learned that our parents can! In a large pan, saute the onion and garlic in the olive oil on medium-low heat until tender. 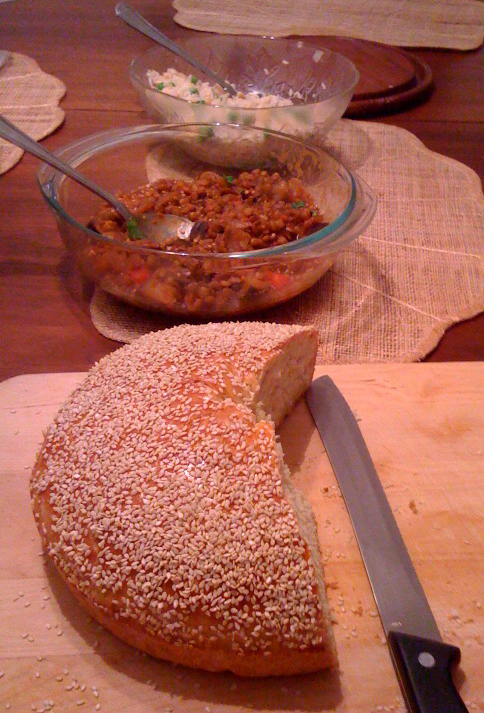 After 5-10 minutes, add in the eggplant and tomato halves, followed a few minutes after by the lentils. Add the tomato juice and extra water if necessary to come just to the top of the veggies, and add the spice blend and salt and pepper to taste (you’ll be adjusting this throughout the cooking). Keep the temperature at a simmer, and cook the vegetables until the lentils are soft, adding water as necessary to keep the mixture mostly covered (this took about an hour and a half for me). For the garnish, thinly slice about half an onion and chop a clove of garlic. Get some oil in a pan very hot, then toss in the onions and garlic and cook until they are browned and as crispy as you’d like. You can also add some cilantro to the top to add a bit more color. This recipe serves 4-6 people, and is great over rice.